I am a big believer of time spent with someone as a gift. The gift of the memories you can not buy – and long after the flowers have died or the chocolates have been eaten – you remember the time you spend with someone. Typically for me that means doing something active together. The best Mother’s Day memories are the times that my teens acquiesce and do what I ask of them, because it was Mother’s Day. Here are a few choice ones from our list (and one that would never make our list). 1. Go on a Hike: We are lucky to live in Colorado where there are trails everywhere. Hiking can be easy. 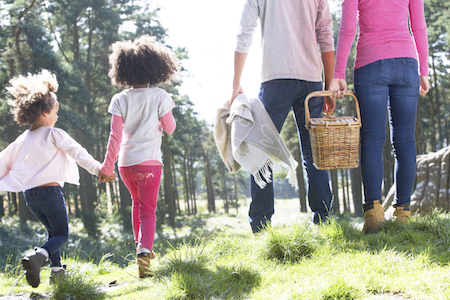 Pick a hike that you can do with the whole family. Something that makes it even more fun is if you pack a picnic and plan a fairly short hike just to get to the picnic. Hiking is simple and costs NOTHING to get started. We sometimes do the picnic idea in reverse – where we walk to the store and then figure out what we are having for dinner. We walk home while carrying all the groceries (this is sort of on the move weight lifting). 2. Play Tennis: When was the last time you told your kids to gang up against you? Seriously the kids love to play two on one tennis. It doesn’t have to be a serious game where we keep score. Just hitting the ball to each other is fun. And it is a very inexpensive sport to play. I grabbed a couple tennis rackets and a sleeve of balls from WalMart for just $20 or so. 3. Try a New Class Together: Nothing makes my daughter giggle more like she did when she was little than the time we went to a Hot Yoga class together or the time I attempted a Barre class (Seriously! It’s not just dancing). She could do the moves better than I could – and I looked like a discombobulated dork. There are several gyms (I belong to 24 Hour Fitness) that will offer free day passes – before you have to commit long term to have your son or daughter be at the gym with you. 4. Go to the Batting Cages: There are a couple batting cages near our house. It is fun to go and make a competition on who hits the most balls. My son got a total charge out of this one! 5. Garden: While this would never make it to my own personal list (I have a black thumb), I know that many of my friends get great pleasure from gardening. Planting and pulling weeds is (supposedly) a great workout and digging in the dirt a stress reliever. The kids will get a kick out of you telling them to go outside and get dirty! The cost is inexpensive as you can get seed packets for under a dollar. 6. Sleep: A full night’s sleep is so very necessary and good for your health. Rather than waking mom up to try to give her some extravagant brunch – how about you let her rest.